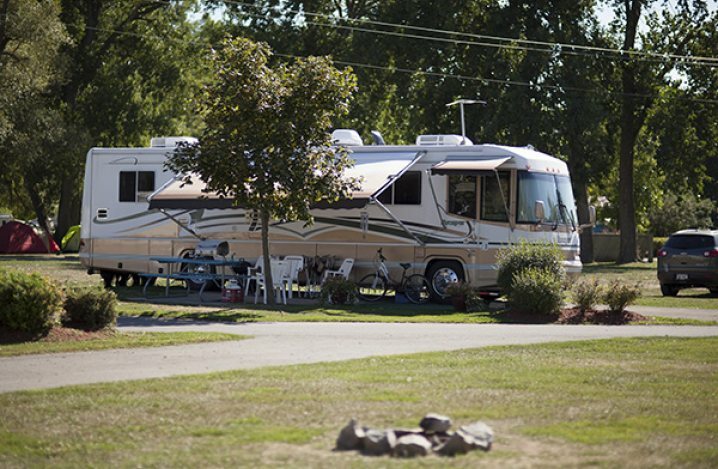 There are 15 Carefree RV Resorts in Ontario. They're all located in the southwestern part of the province, and most are within a two hour drive of Toronto. Some of them are huge, and have a lot of amenities. We think they're mostly geared for families who want an "all in one" resort experience. The first resort we're going to tell you about is called Sherkston Shores. It's located 90 minutes from the city of Toronto, and only a few minutes from the U.S. border at Buffalo, New York. Americans have such a positive benefit in coming to camp in Canada this summer, with nearly a 20% currency exchange gain when turning a U.S. dollar into a Canadian one. And, we're going to tell you about a way to save yet another 20% for readers of Travel with Kevin and Ruth. Sherkston Shores is located in Ontario, but just west of Buffalo, NY on the north shore of Lake Erie. I expect that families love this place. Huge heated pools, waterslides, a splash park and two miles of sandy beach front. Activities for kids, and family bonfires with hotdogs and smores provided. And activities for moms and dads too with wine tasting nights, live music in the lounge, and a Father's Day fishing tournament. Lots if activities on the calendar for everyone. 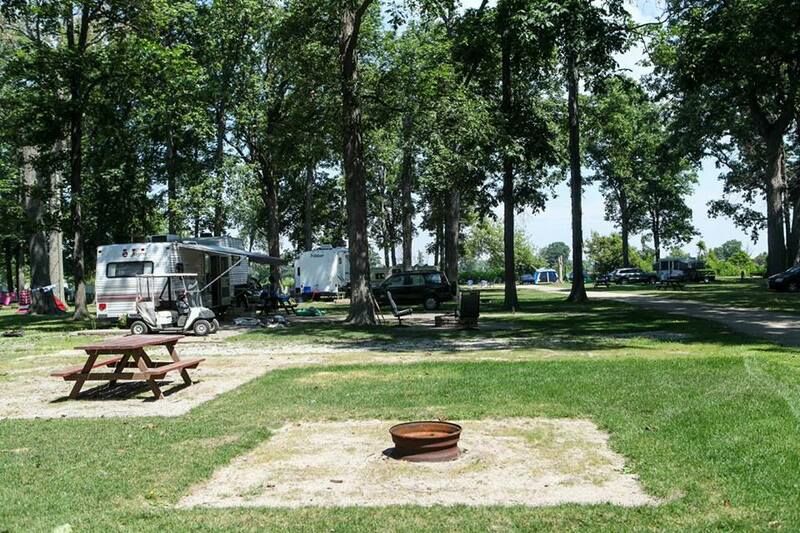 Spacious 50 amp RV sites in the "premium" section of the resort. Looks like they have a beautiful beach. Use promo code Blog20 for tent and RV Sites. Use promo code BlogRT for cabin and cottage rentals. Not a bad deal, especially for Americans coming to Canada. Next up is Willowood Resort. Only 20 miles from the U.S. border at Detroit, Michigan. In Canada, but only 20 miles from Detroit. Willowood's family-friendly grounds feature a playground, horseshoe pits, sand volleyball courts, an outdoor movie theater and miniature golf course. Guests keep cool relaxing and swimming in the large pool, the kiddie pool and the splash pad area. There’s even an arcade room to entertain the kids on rainy days. And there's a whirlwind social calendar that includes story time, chocolate bar bingo, crafts, potluck dinners, dances and movies. They have a pretty good deal at this place for anybody who wants to stay for a while. Up until June 27th, it's $600 for 6 weeks. Not sure that Willowood fits the "resort" moniker quite like Sherkston Shores does, but it does look like a nice wooded campground. With 329 RV sites as well as cabins and park model rentals, Willowood has camping arrangements to suit every family and budget. 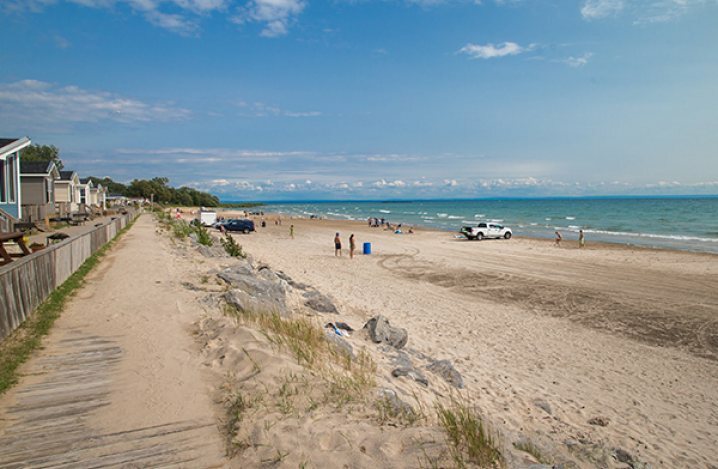 Carefree is offering a special offer exclusive to you - 20% off daily rates on RV sites, cabins and vacation cottage rentals at 14 of the Ontario Carefree RV Parks. This promotion is valid from May 1- June 30. WOW Kevin you've got some real deals here for those who can get up to Canada especially before June 27. $600 for 6 weeks is amazing. Yep, and that's only $480 USD for six weeks. I used to work with a lady who, along with her husband, lived at Sherkston Shores. They would commute daily to Burlington. She worked with me, and he worked at a high school. They loved it, but I couldn't get my head around that commute. I've only been there once for a visit, and it looked like a neat place. I don't think we have ever been to Sherkston Shores before, I guess if we re ever in that area we will have to check out the town. Wow, that would be one heck of a commute to have to do each day. Don't think I could do it! Went to book one night at the Willowood for June 20th. If you use the book now option which takes you to the carefree reservation page the Promo code field only allows for the entry of 6 characters. (The promo code is 7 characters) If you use the calculate rates page for the site, then enter the promo code the site returns a, "Promotion code is invalid or unavailable." error. Using the calculate rate pop up window and continuing the reservation you get to the carefree reservation page. On this page you get a, "Stay length must be at least 2 nights." message. So changing to two nights for a standard rv site( FHU only 30 amp) with taxes the total is $119.78 CDN. There is a note on the page, " Please call Willowood at (519) 736-3201 if you need assistance with making your reservation." I guess I could call them to see if they give me the 20 percent deal, but still with 20 percent off it certainly is no deal. I think I will overnight it at the local CTC store. *smile* You might want to check with Carefree about the promo code length they gave you for the write up. Seems their hotel reservation software they use only allows 6 characters. The company admits there was a hiccup, and they apologize profusely. New promo codes are Blog20 for RV and campsite rentals, and BlogRT for cabin rentals.